The Kroger Co. plans to introduce an “ugly produce” brand in stores early next year. Called Pickuliar Picks, the brand’s first items are slated to start appearing in Kroger Co. supermarkets in the first quarter of 2019, according to Nicole Davis, senior innovation manager for Our Brands at Kroger. She unveiled plans for the program last week in a presentation at the U.S. Chamber of Commerce Foundation's Food Forward Summit in Washington. 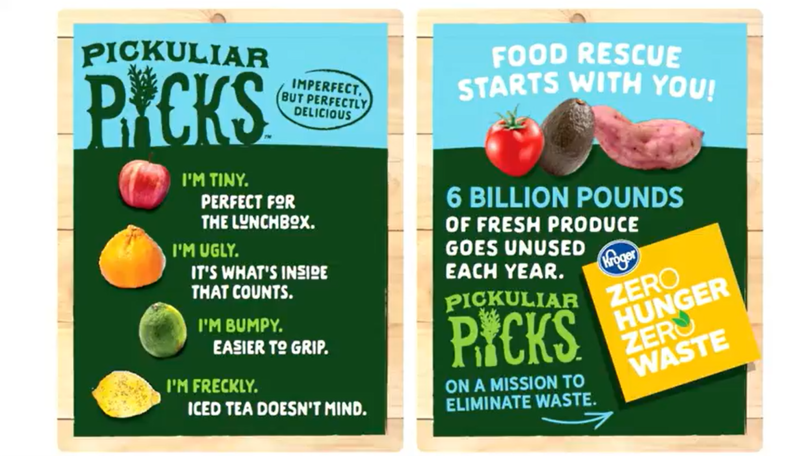 The tagline for Pickuliar Picks is “imperfect but perfectly delicious.” Davis noted that 6 billion pounds of fruit and vegetables go unused each year because of below-standard appearance or size, despite being fine for people to eat. In her presentation at the summit, Davis showed mockups of imperfect produce in Pickuliar Picks packaging, such as tomatoes, bell peppers, limes, yellow onions and gala apples. “We’re hoping to encourage our customers to try these items and help us work through them, because there’s so much waste,” she said. The imperfect produce brand is part of Kroger’s Zero Hunger/Zero Waste program launched in September 2017. Through the initiative, the Cincinnati-based grocery retailer aims to eliminate hunger in the communities it serves and food waste companywide by 2025. In marking the program’s one-year anniversary last month, Kroger said the effort addresses a “fundamental absurdity” in the U.S. food system: 40% of the food made here is discarded even as one in eight Americans go hungry. Yesterday, Kroger was commended by the Trump administration as a new participant in the U.S. Food and Waste 2030 Champions initiative, a group of about two dozen companies that have set a target to cut food waste in half by 2030. Other grocery retailers that have joined the effort include Ahold Delhaize USA, Weis Markets, Walmart, Sam’s Club, Wegmans Food Markets, Sprouts Farmers Market and MOM’s Organic Market. In the United States, food waste is estimated at 30% to 40% of the food supply, based on figures from the USDA’s Economic Research Service. About 31% of food loss happens at the retail and consumer levels, which in 2010 corresponded to roughly 133 billion pounds and $161 billion of food, according to the agency.